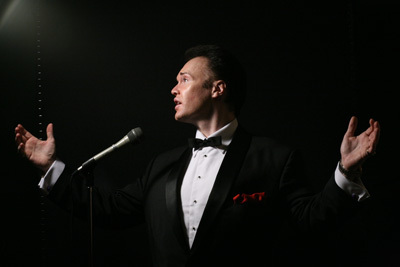 Not only does Ian perform the UK’s leading Frank Sinatra tribute experience but also performs a salute to the other great Kings Of Swing from Mr Sinatra’s period as well as more modern day favourites like Michael Buble. Sit back, pour yourself a cool Martini and enjoy an evening featuring some of the finest songs from the last century as sung by these great entertainers with Ian’s eclectic Kings of Swing show. One of the coolest swingers in The Rat Pack and one of Frank Sinatra’s closest friends. Let Ian serenade you with Dean’s classics like That’s Amore, Sway, Little Ole Wine Drinker Me, Ain't That A Kick In The Head & Everybody Loves Somebody. Sammy was a great American entertainer and the most multi-talented of the Pack. He was a singer, dancer, impressionist, comedian and actor and played a number of instruments. This American singer of popular music, standards and jazz has proved what a truly talented entertainer he is. With an outstanding career spanning five decades, his comeback in the 90’s expanded his audience to a younger generation while keeping his music style intact. Hear Ian sing some of Tony’s many hits including classics like ‘I Left My Heart In San Francisco’, ‘The Good Life’ and ‘Rags To Riches’. Nat ‘King’ Cole has an unforgettable sound and is renowned for his incredible ballads. Close your eyes and let Ian remind you why Nat King Cole is remembered as one of the finest singers of the era with hits like ‘Mona Lisa’, ‘Unforgettable’, ‘ The Christmas Song (Merry Christmas To You)’,‘Ramblin’ Rose’ and ‘Those Lazy-Hazy-Crazy Days of Summer’. Ian is famous for emulating the smooth liquid tones of Andy Williams with classic hits like ‘Can’t Take My Eyes Off Of You’, ‘Music To Watch Girls By’ and ‘Where Do I Begin’.